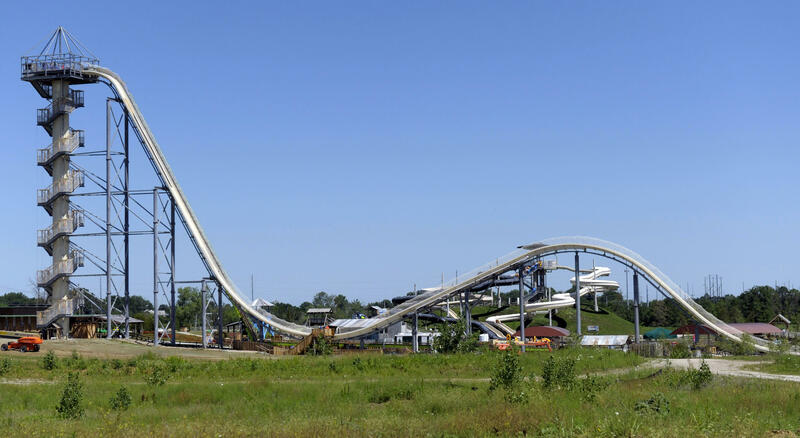 TOPEKA, Kan. -- A state lawmaker is seeking to strengthen regulations for amusement parks in Kansas after a colleague’s 10-year-old son was killed last year on a water slide dubbed the world’s tallest. Rep. John Barker’s bill would require the insurance companies representing the parks to hire a certified engineer to inspect the rides. Under current Kansas law, the parks themselves can choose the inspectors, who don’t necessarily have to be engineers. Caleb Schwab, the son of Olathe Republican Rep. Scott Schwab, was killed Aug. 7 aboard the “Verruckt” waterslide at the Schlitterbahn Water Park in Kansas City, Kansas. The family reached an undisclosed settlement in January with the owners of the park and the manufacturer of the raft that carried Caleb on the ride. The slide had passed private inspections permissible under state law earlier in the summer. Barker, chairman of the House Federal and State Affairs Committee, acknowledged Wednesday that he couldn’t be sure whether his proposal would have saved the boy’s life. “Accidents are accidents, but you need to take all care and due diligence as possible, and that’s what the operators need to do,” said Barker, an Abilene Republican. Kansas didn’t have any inspection requirement until 2009 when Schlitterbahn opened. The committee’s report says a Schlitterbahn lobbyist saw “no problem” with the requirement but that the company that operates Schlitterbahn would prefer a “Disney exception” for large parks that would allow companies to inspect them in conjunction with the state. Schlitterbahn spokeswoman Winter Prosopio said the lobbyist, Mike Hutfles, was just answering a question about how the park operates and didn’t ask for any exemptions from oversight laws. The minutes of an October 2007 meeting say Hutfles mentioned the exception the company operated under in Texas. Prosopio said the company had not yet had time to carefully review the bill. “We support anything that increases safety on all rides,” she said. Colleen Mangone, a spokeswoman for the International Association of Amusement Parks and Attractions, said in a statement that the organization is still reviewing the bill but that it applauded efforts to “enact effective regulation of amusement ride safety.” She said that’s the industry’s top priority. Attorneys for the Schwab family and two women injured on the ride with Caleb could not be reached for comment. The ride has been closed and will be torn down when an investigation is completed. Barker said the committee would hold hearings on the bill March 23-24.